What do you think of our amazing #EETCRAFT flier? That’s what we’ve decided to hashtag our Edinburgh Etsy Craft Party on the 6th of June; perfect, right? 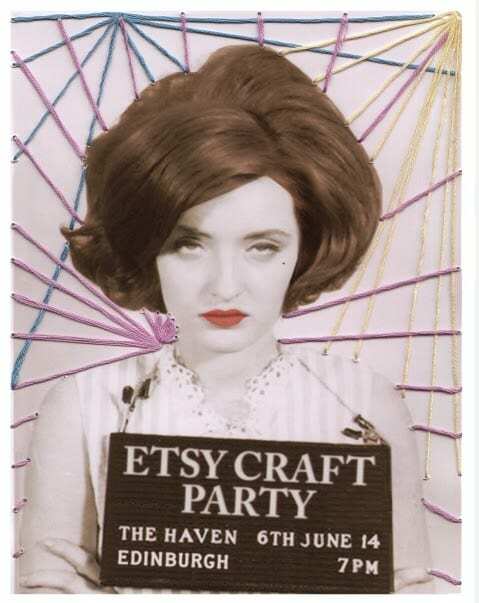 We’re over the moon to have *sold out* the event and have our new venue booked at The Haven, a totally pin-tastic cafe that’s going to be the perfect spot for our craft-a-thon. We literally cannot wait! So, whilst myself, Zyzanna and Fiona (my wonderful partners in crime!) are busy prepping for the event I’ll be certain to keep you posted with peeks of everything as we pull it all together. I’ll be sending out an email to all our lovely party goers with an update very shortly, so keep your eyes peeled! We’ve got a few wonderful makers sponsoring our goodie bags by sending us treats for our guests, so if you’d like to get involved and support our party, please don’t hesitate to get in touch! We’ll be advertising each maker on our blog for a month after the event as well as sharing lots of pictures from the evening and linking your products on our blog. Its a great way to have your wonderful work seen by lots of new people! If you would like more information on our stats and when we’d need your products by please email me at [email protected] It’s going to be a riot!! So, watch out for more snippets of awesomeness and perhaps even a secret giveaway after the event… Can’t wait to share more! I am thinking about going to the party in my area. Sad to say there isn’t a party planned near us and I have decided not to organise a Cambridge one this year. I will craft vicariously through your party!